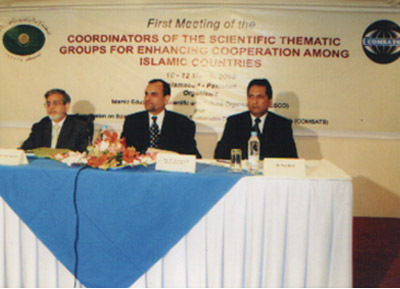 COMSATS and the Islamic Educational, Scientific and Cultural Organization (ISESCO) jointly, organized a 3-day International Meeting of the “Coordinators of the Scientific Thematic Group for Enhancing Cooperation among Islamic Countries”, from 10th to 12th March 2009. The meeting was intended to serve as the foundation fo r the establishment of the virtual ‘Scientific Thematic Groups’, initially in nine areas: New and Renewable Energy; Bio-sciences/Biotechnology and Genetic Engineering; Bioethics; Environment; Mathematics; Water Management; Nano-Technology; Science Academies, and ICTs in Science and Technology. These thematic groups have been created for the purpose of providing a permanent forum for the researchers and scientists to: interact with each other, share knowledge, address common concerns, as well as develop and organize realistic joint programmes for achieving excellence in scientific research that would result in science-led economic growth. The coordinators will monitor knowledge sharing and facilitate collaboration between the group members by conducting and facilitating discussion forums, chat sessions, .information dissemination, etc. The organizers of the meeting held training courses for the coordinators to familiarize them about the basic working of the thematic groups on the web-portal: www.icspr.org.ma. Furthermore, there were technical sessions comprising presentations by the coordinators related to their specific thematic groups and/or scientific fields. Scientists from Jordan, Egypt, Pakistan, and Malaysia participated as coordinators in the meeting. The Federal Minister of Science and Technology, Government of Pakistan, Dr. Muhammad Azam Khan Swati formally inaugurated the meeting. He showed his confidence in the efforts made by ISESCO and COMSATS, for enhancing cooperation among Islamic countries. Executive Director COMSATS, Dr. Imtinan Elahi Qureshi and Director (Sciences) ISESCO, Dr. Faiq Billal, appreciated the coordinators of the thematic groups for voluntarily taking up this responsibility. They expressed the hope that the thematic groups would be able to achieve the objectives of this initiative.